EMTP-RV is a sophisticated computer program for the simulation of electromagnetic, electromechanical and control system transients in multiphase electric power systems. EMTP-RV is based on cutting edge technologies developed and validated by internationally recognized experts from the power system industry. The simulation uses a matrix formulation, unique in the industry, for the load-flow, steady-state and time-domain solutions. Theoretical advantages are emphasized and demonstrated through practical examples provided with the software. An open-architecture graphical user interface (GUI) is available to maximize flexibility, and allow creating and maintaining very large and complex designs. Example of a large grid modeled in EMTP-RV: The French transmission network (200 substations, 380 lines, 45 generators with detailed controls, HVDC converters…). On a regular computer, only 100s are required to simulate 10s with a time-step of 100µs. Contrary to other software packages EMTP-RV does not have topological limitations. Devices can be interconnected as required in actual networks without usage of artificial elements. EMTP-RV uses a sparse-matrix solver which provides major computational speed advantages for the simulation of very large scale power systems. The programmed dynamic memory eliminates network size limitations. Grids are assembled and simulated directly with highly accurate methods and models. EMTP-RV includes a recognized multi-phase and unbalanced load-flow solver and time-domain simulation are automatically initialized from the load-flow results. Therefore, EMTP-RV does not require to be linked with any external load-flow solver. All simulations from load-flow to time-domain can be conducted in the same environment. Simulation of a single-phase fault in an unbalanced 230kV Network. Time-domain analysis is automatically initialized from EMTP-RV Unbalanced multi-phase load-flow results. For time-domain simulations, EMTP-RV has a unique iterative solver for its nonlinear models (transformer magnetization, surge-arresters, power electronics…). The efficiency and performance of the iterative solver allow to achieve highly accurate results without compromising computational speed. An iterative solver is also used for the computation of control block diagrams. This offers, again, unique advantages and eliminates user intervention for the correct/accurate simulation of complex control systems and user-defined model equations. 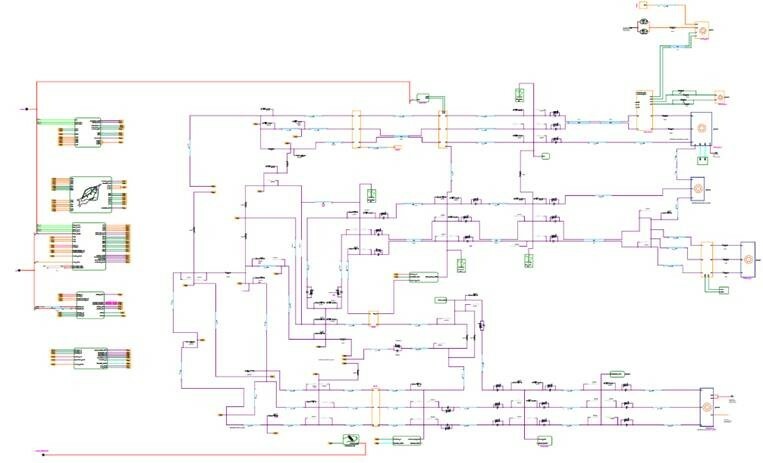 CIGRE B4 DC Grid test system modeled in EMTP-RV. The model includes detailed MMC VSC-HVDC control systems. The treatment of discontinuities in EMTP-RV is based on changing the trapezoidal integration rule to the Backward-Euler method at the discontinuity time-points. This approach eliminates numerical oscillations. In practice, all the numerical technologies of EMTP-RV associated with the high quality of the Graphical User Interface (GUI) make it the perfect tool for the simulation of large, modern and complex power systems. 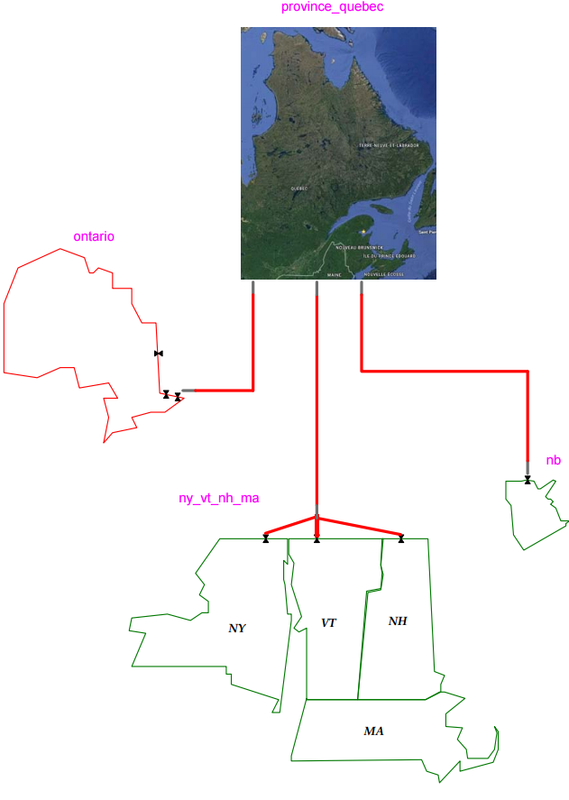 For instance, Hydro-Québec, the power utility of Québec, RTE the French TSO, CENACE, the transmission system operator of Mexico and conEdison in New-York, model and simulate their entire networks (including lines, cables generators, HVDC links, Wind farms, protection systems…) in EMTP-RV. Example of a large grid modeled in EMTP-RV: The Hydro-Québec network (more than 60000 power and control devices and more than 55000 nodes). Parametric studies simulated on multiple core computers are performed with this model. The model is built using subnetworks representing each region. J. Mahseredjian, S. Dennetière, L. Dubé, B. Khodabakhchian and L. Gérin-Lajoie: “On a new approach for the simulation of transients in power systems”. Electric Power Systems Research, Vol. 77, Issue 11, September 2007, pp. 1514-1520.